Today’s post is about my better side, the one who keeps me straight and is available to call 911 when I am climbing around on roofs. My wife Carol has been my better side for 47 years now. As I stated in my Who We Are page, I think I’ll keep her. Carol loves craft projects as long as they require the use of needle and thread. When we bought our first RV, we had one strict requirement. we had to have space for Carol’s Corner. Here we sit in our first home on wheels. 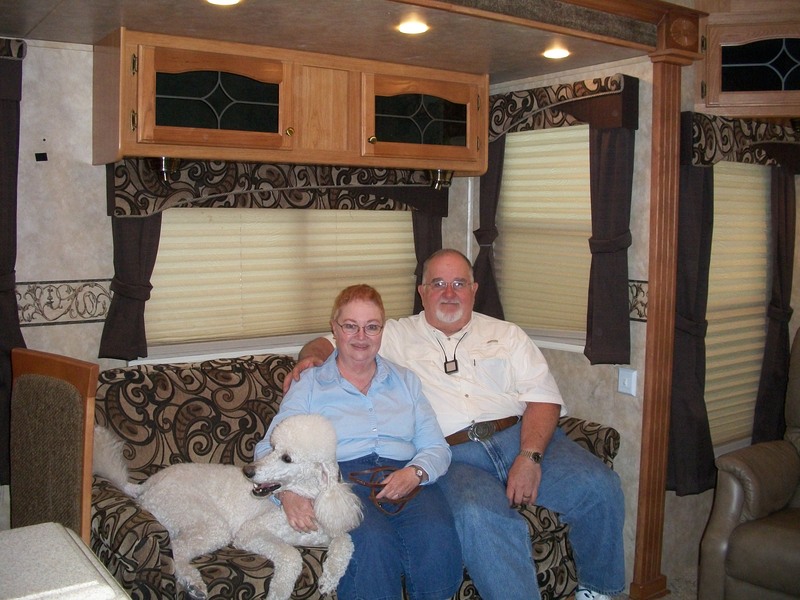 May 4, 2011 we drove to Elk City, OK to complete the purchase of our 2008 Cedar Creek 38 foot fifth wheel. By the time we got it back to our house in Corpus Christi, TX we determined that this very uncomfortable couch would have to find a new home because that is where Carol’s Corner would go. By October 2011, this is what the space looked like with the couch removed. Then the pieces came in. I am sure glad I practiced the principle of measure twice and cut once as I squeezed the carcass through that narrow RV door. Carol was on the inside steering the carcass. We only had a couple of inches to spare. Once it was in and turned, it was easy to lay it down to position it in the space where the ugly and awful couch once resided. With the top in place, it is beginning to look like a decent work area. 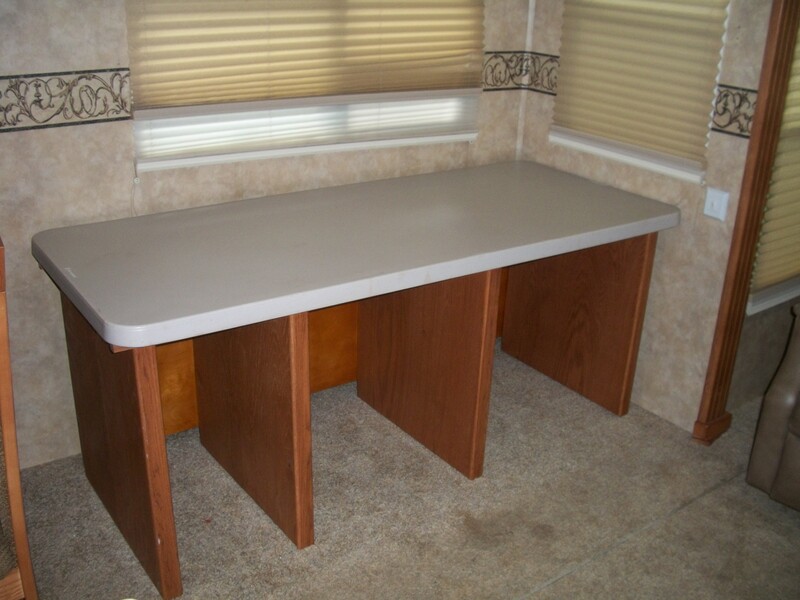 The top is from a standard 6 foot long folding table similar to what is available at Home Depot, Lowes, CostCo, Sam’s or where ever you prefer to shop. For a closer look, click here to see the table Home Depot sells. I removed all metal legs and frame from the table. So all that is left is the light weight top. Now Carol can begin to load up Carol’s Corner. Carol’s embroidery machine fits into the slot on the left when we travel and the roll out bins are turned around for travel so the drawers do not open. We were in Blue Ridge, GA workamping at Windy Valley Llamas during the summer of 2012. Carol is deep in thought about the project she is working on. 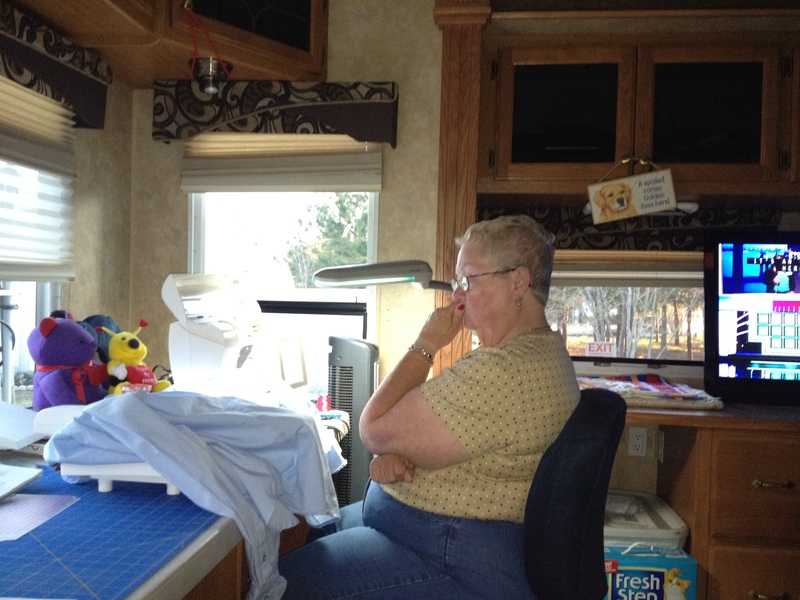 You can tell from this photo that we moved Carol’s Corner to the rear of the fifth wheel. It only made sense because it gave her a bit more floor space and much better natural lighting. 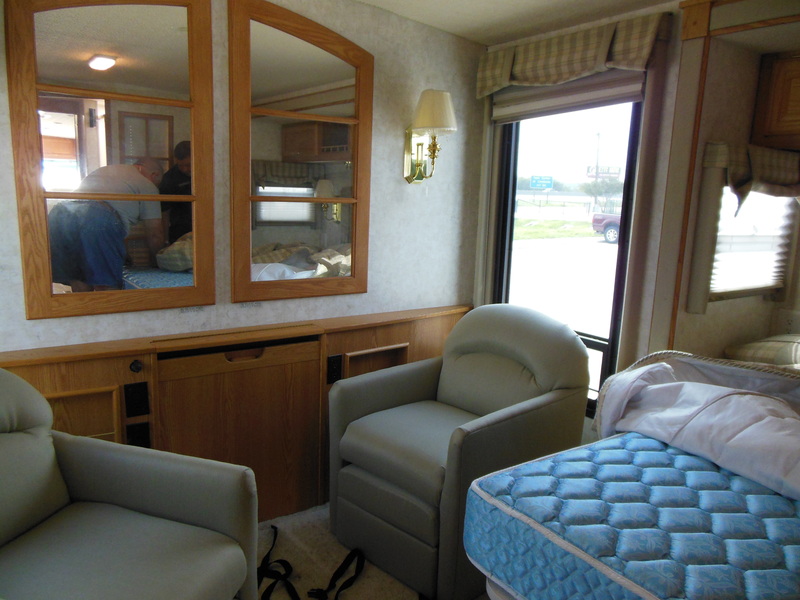 Carol’s Corner was doing just fine until on a whim, we decided to trade the Cedar Creek fifth wheel in on a 38 foot 2004 Winnebago motor home. The only way the deal could work is if we had space for Carol’s Corner. As you can see, the bedroom had this nice little sitting area. As with most RV furniture, we decided the uncomfortable chairs had to go. This is where Carol’s Corner would find a home. We had fun squeezing the carcass into the motor home door. 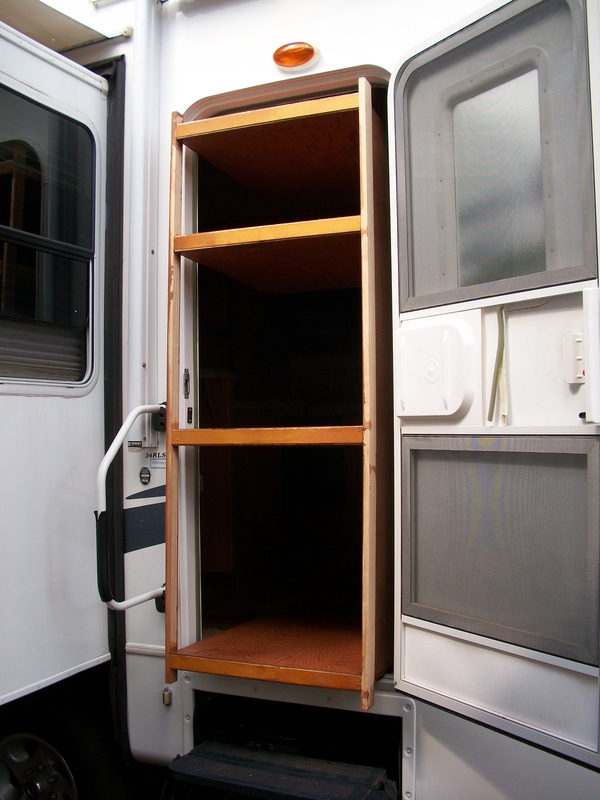 We did determine the magic number for RV doors is 28″. 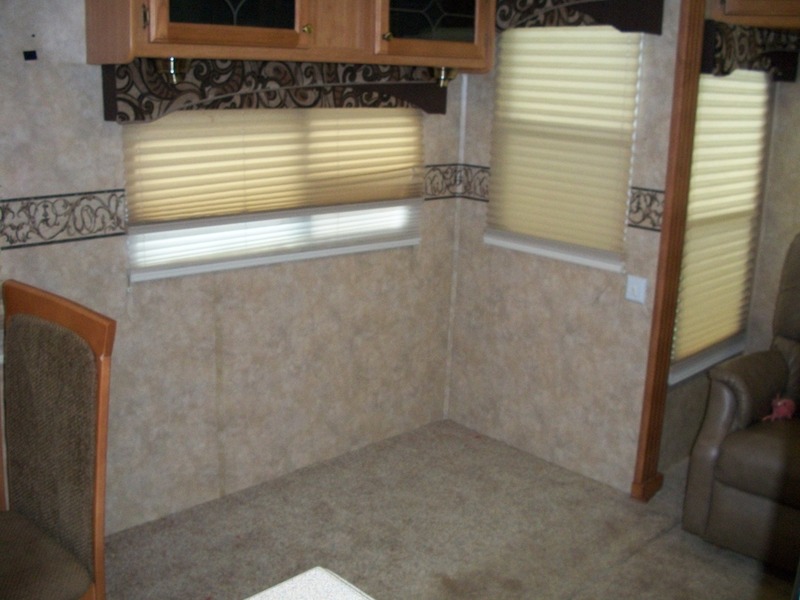 The 8 foot width of the motor home is the same as the 8 foot width of the fifth wheel. That made it easy for everything to fit just fine. Carol is happy as a queen working away in Carol’s Corner. 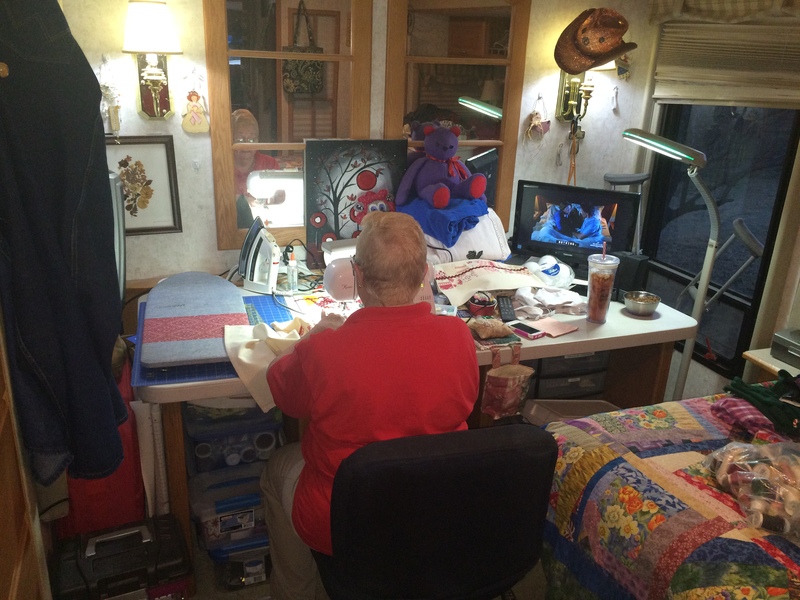 Her small ironing board is on the left, The red case on the left is her embroidery machine’s embroidery arm. She even has a scrap bag just to her right. Under the TV is her DVD player so she can catch her favorite movies while stitching away. On the right you can see her Ott light. It has seen better days. It got caught in the bedroom slide one day as we were setting up the motor home. Now we pay attention to where it is when we close everything up for travel. The crutches — we won’t go there. When you have a sophisticated high-tech embroidery machine you always need a back up. She recently discovered that the feed dog on the embroidery machine will not come up to operate as it should. While in embroidery mode, the feed dog drops since the embroidery arm moves the fabric every which way. Carol’s backup machine also works well when she is going to a sewing class. 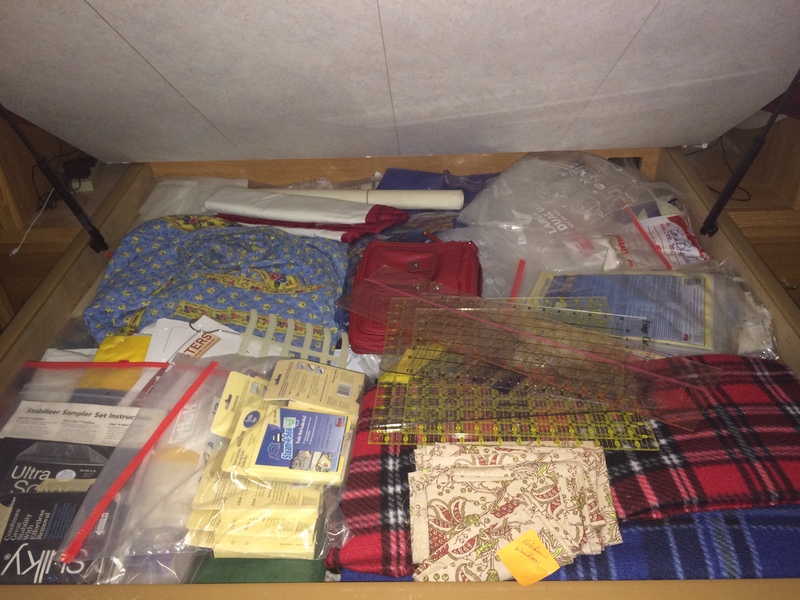 I know the one question you are thinking – “Where does Carol keep her fabric stash?” Well, the fabric stash is under the bed. To be a happy RVer, you must be use all available space where ever it is found. 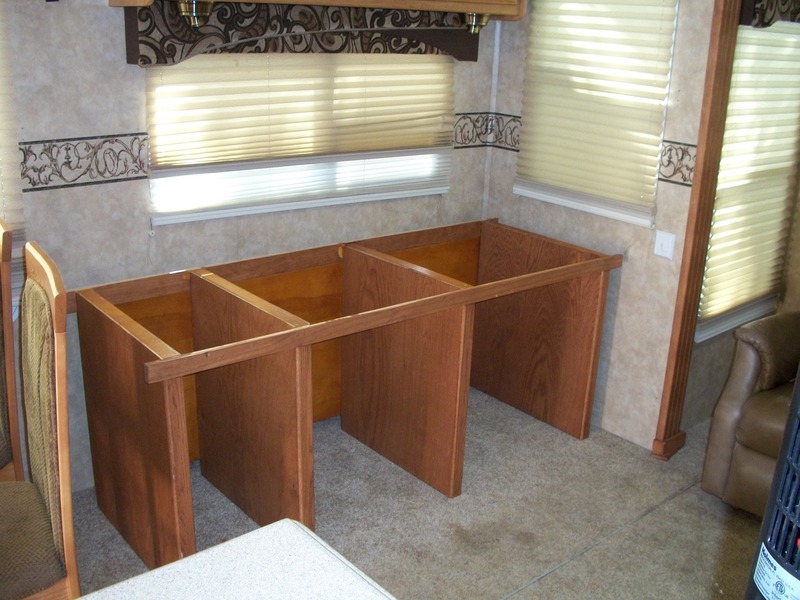 I have my tools outside in compartment under the motor home, Carol has her stash under the bed. I am sure you can figure out what this is. We call it the birth of a new project. Carol’s Corner will be busy for a while. Hope you enjoyed the tour. Thanks for stopping by, y’all come back now. 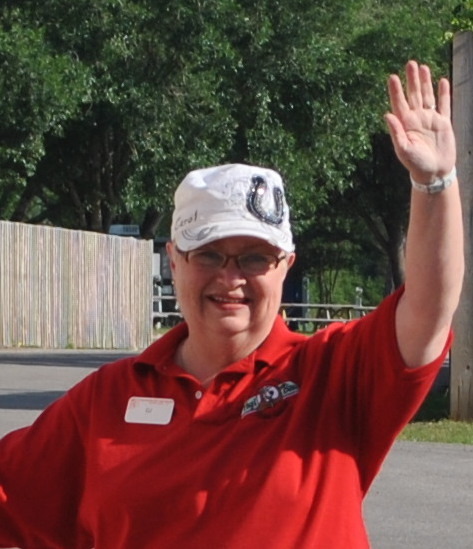 This entry was posted in Carol's Corner, WP-Daily Post and tagged blogging101, Carol's Corner, craft, quilting, RV Mods, sewing. Bookmark the permalink. Grest article on Carol. I’m trying to downsize my area. Quilting is supposed to be good for your brain etc. Enjoyed this post. Carol, I have a new hobby – basket making!! I’ve 3 and am working on my 4th. Loved the article. 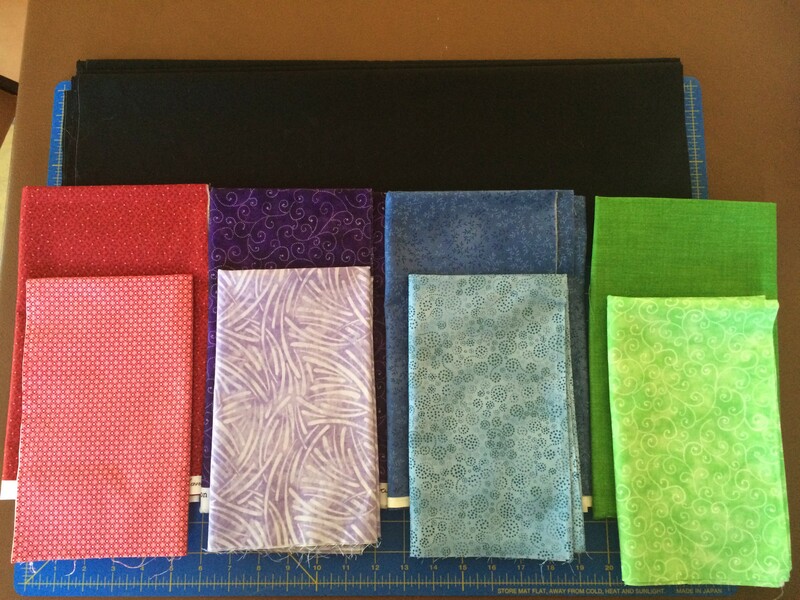 As a fellow quilter, I am all about “Carol’s corner” too! What an adventurous life! Awesome! It’s great that you have managed to keep a quilting and sewing space for Carol. 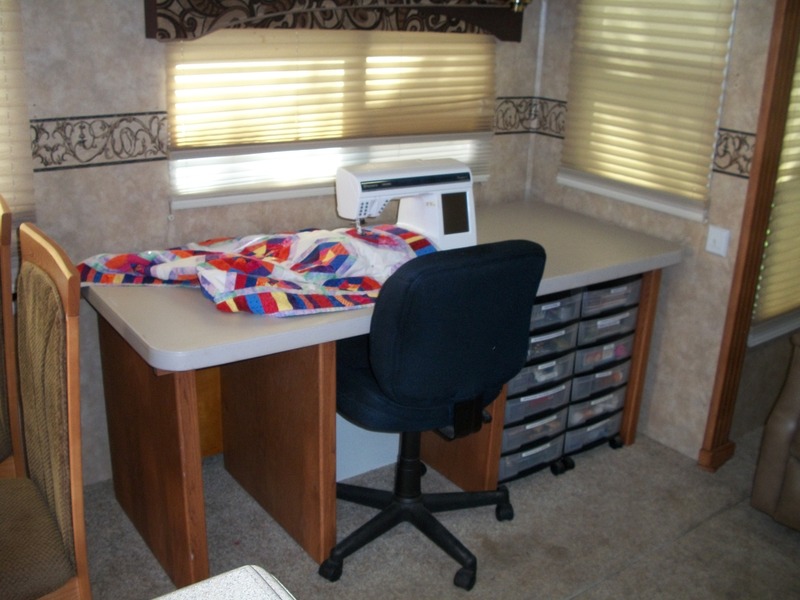 With the limited space in an RV, it must be a challenge to keep your fabric stash under control! Happily married for 47 years. This husband knows what it takes. Happy wife…happy life!!! I love that you have made your creativity your passion! I love having fun doing what I love doing. Mine is writing…can’t find enough time for it. I read above there are quilting, basket making, sewing — the list is endless. Let’s hear it for following our passions! 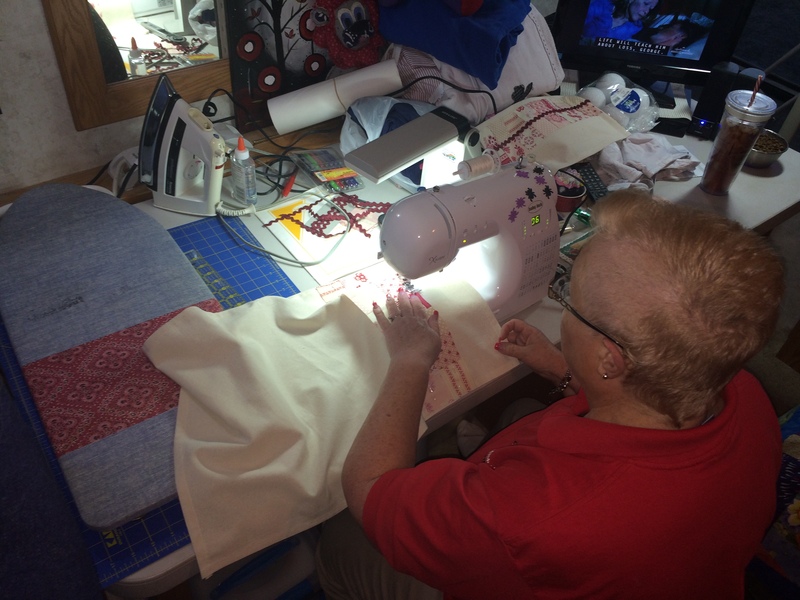 Pingback: FAQ #9- Can you really sew in your RV? | RV There Yet? Heading up to Lake Corpus Christi June 1, 2018. Buying 5th wheel next year. I cannot stand putting quilt stuff away every day. Do not like clutter. Wondering if another bedroom and removing the bunk beds would be worth it. What do you think. We live in our TT and are Park hosts. Thanks for the pics. Carol is a lucky gal. Our 5th wheel with rear living was perfect for us. Bunkhouse configuration would work if you pulled out the bunks. Rockport is hosting s big sale event this weekend. Come look. Set in all 5th wheels and act as if this is your home. This will help you find a floor plan that suits your needs. Then with a floor plan, start looking around. Check out http://www.rollingretreats.com/. That is where we bought our used Cedar Creek. Alicia Slade is honest and fair. They own a DRV dealer in Elk City, OK. You should be able to find a used unit for your budget. Does the $50K include truck? no. have 2500 silverado. Tks for your prompt information.